In 2010 teachers at Moharimet Elementary School in Madbury, the Josiah Bartlett Middle School in Bartlett and a home school family in Lebanon are working with Forest Watch to pioneer maple studies. These schools already have active sugar making activities, sugar maples they tap and even their own sugarhouses. Our home school friends are ninth generation sugar producers! If your school or home school group also has a sugaring operation, please contact us to join this pioneer project. Forestry studies of sugar maples will introduce students to skills and tools used in many environmental fields. Students will select three to five sugar maples to be permanently tagged near their school. They will establish a 30x30 meter sampling plot. They will learn a suite of forest plot biometric measurements such as tree height, diameter at breast height (DBH), canopy closure and ground cover. Sugar maples, known as the “rock” maple to many New Englanders, lives up to its name: It is very difficult to core. But we hope students will core their trees at least once every 5 years. Sugar maples can live for 400 years! Maple Watch students will also use global positioning systems to find the latitude, longitude and elevations of their schools. Six leaves emerge from each bud at the end of April. 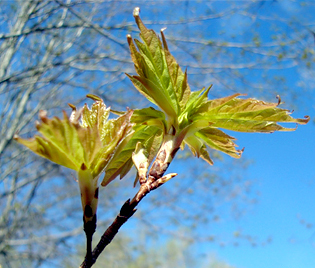 Maple Watch hopes schools will help us to map the start of sap season, Spring bud burst, the height of Fall foliage color and other seasonal or phonological changes. Field collections in Maple Watch will begin with sap in the spring. Students may want to learn about sugar, how it contains solar power, and how sugar producers work with sugar density, color and taste to make good syrup. Students can check their maples’ health with simple anatomical measures of buds. And they can watch buds swell at the end of sugar season. What is inside a bud? Check out our program, What’s in a Bud. When leaves open in late April, students can study the anatomy of leaves, very different from white pine needles. What makes the difference between a conifer and a maple? Can students find flowers on the maple? Leaf measurements will involve such activities as calculating leaf area, examining water content and making fresh sections of leaves, twigs and buds. Sugar maples also have a whole ecosystem of insects, animals and birds that is slightly different from the white pine’s community. Who lives with the sugar maple? Check out one neighbor on our program, Snow Flea, A Maple Neighbor. As schools enter summer and when students return to school in August, major leaf collections, patterned on white pine protocols, can help us learn about maple health. Climate change is changing New England’s seasons. Already, climatologists believe that the sugar season is starting a week earlier than the historic norm. Maple Watch students can help us see that change by observing and recording dates—sap season start, run days, last run day, bud burst, fall foliage change, and leaf fall. This website and its new mapping capabilities will invite schools to directly input their observations to the map. All of us should be able to see spring come to New England as our map lights up to pale green. Maple Watch students and teachers will submit leaf samples to UNH for spectral analysis. The leaves will be scanned in the Forest Watch Visible Infrared Intelligent Spectrometer. This part of Forest Watch introduces students to the growing interconnection of biology with the physics of light and the chemistry of photosynthesis. The reflectance curves of leaves provide information about chlorophyll content, water content and general age and health of the needles. Forest Watch also will invite schools to apply remote sensing data, satellite imagery collected by Landsat Thematic Mapper, to their school studies. The light reflected from one school’s sugar bush will be similar to light reflected by monocultures of sugar maples throughout New England. As students learn about the health of their maples, they can extrapolate that information to “read” the health of a region’s forest. Sugar maples are an iconic symbol of New England, a beloved and dominant species throughout its region. Native Americans made sugar. Syrup and sugar were early cash crops for colonists and settlers. And the records sugar producers maintain of family sugar maple operations could provide valuable phenological data as we try to understand changing conditions in the sugar bush. We hope Maple Watch students and teachers will build a cultural component into the program, interviewing sugarmakers in the community, digging into old records for production information and sap season dates, and writing your own thoughts, poems and observations about sugaring. Chlorophyll can be extracted from plants and its concentration may be measured with spectrometric analysis. In the UNH laboratories, this process involves several toxic chemicals, time and a costly spectrometer. Teachers and students may try extracting chlorophyll with simpler chemicals, a household food processor and a camera. Mike Gagnon, our former Forest Watch coordinator and now a teacher at Alvirne High School, is developing a system by which anyone can use simple PhotoShop analysis to develop color comparisons of the green you will see in needles, leaves, or chlorophyll extractions (see Measureing Chlorophyll with Digital Cameras). A relative comparison of color should correlate with the REIPs your school receives from the UNH lab analysis of your needles.